My folks love tomatoes. Any tomatoes. Me, I’m a sucker for a fresh garden tomato and otherwise they leave me cold. So when I come across tomatoes that could use a little help, I jazz them up a bit. Not that these lovelies in the photos needed any help, mind you. 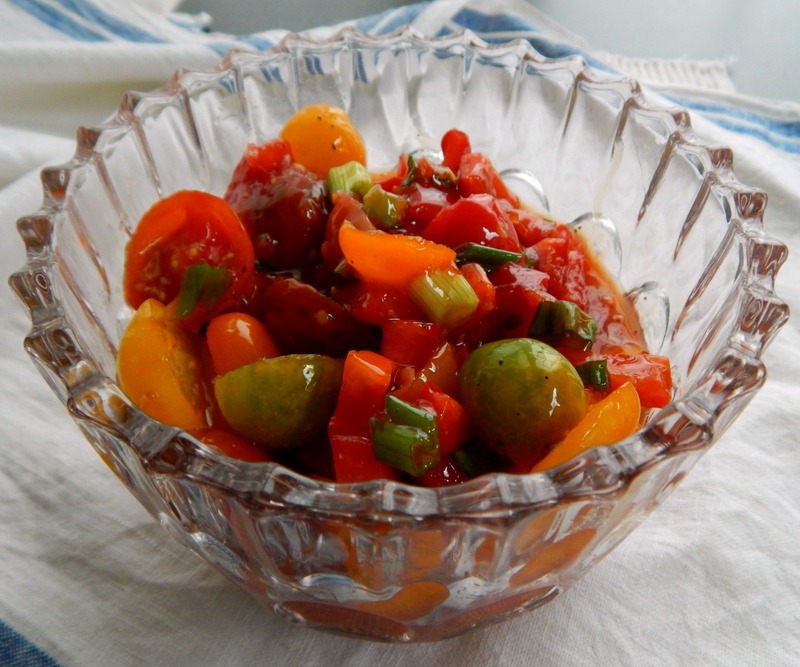 This simple little cherry tomato salad takes minutes to make and takes any tomato over the top. While I used this beautiful mix of cherry tomatoes today, this is just as good with plain old cherry tomatoes or a large tomato cut in chunks. If the tomatoes are very juicy, toss them in a strainer for a few minutes.. I loosely based the dressing on my Bell Pepper and Tomato Salad, which I originally loosely based on a Turkish salad, Ezme. Think of this salad like a Catalina dressing with a bit of a kick from Sweet Chili Sauce. I love that stuff and sneak it into all kinds of things. If you have an Aldi nearby, check them out. They’re so easy to get in and out of and they often have little surprises you wouldn’t think you’d find in a discount store – like these tomatoes. Mix dressing ingredients together, add to tomatoes and toss. Best if it sits for a little while. Note: I like the dressing to be just a bit more highly flavored and salted than expected; by the time it mingles with the tomatoes it will be just right. Slice round objects between two lids! Run knife horizontally thru center..
I’m posting this recipe on Fiesta Friday Blog Link Party, hosted this week by Ai @ Ai Made It For You and Jhuls @ The Not So Creative Cook. This entry was posted in Click here for Fabulous Food Posts and tagged Cherry Tomatoes, Frugal Hausfrau, ketchup, Salad, sweet chili sauce, tomato salad, Tomatoes. Bookmark the permalink. Looks delicious! Perfect for a summer picnic! You really know what food to bring! I love the sweet chili sauce in this salad. I love tomatoes, too! Thanks for sharing at Fiesta Friday party, Mollie! My pleasure, Jhuls! And thanks for hosting, again! My little dude loves cherry tomatoes year round too. I tend to prefer them during the summer also. I am going to have to make a batch of this though! Carlee, it’s so good – go light on the chili sauce and I’ll be Jax will love them! That would be a fantastic bruschetta topping, or even a simple pizza topping. Yum! Oh, you’re so right – I don’t think of brushetta often enough A little spread of ricotta and this spooned over?! Mmm that sounds great with sweet chili sauce! I would have never thought to add that, great idea!